Friday, November 11, was a day for honoring our veterans, those who have served our country with valor and honor. It was also an historic occasion as on that date in 1926, the number 66 was assigned to the newly minted highway that stretched from Chicago, across the heartland and through the southwest, to Los Angeles. Fittingly, this past weekend there was a celebration in Los Angeles to commemorate the 90th anniversary of the most famous highway in America, and some of the events took place at the highways original western terminus – 7th Street and Broadway Avenue. The fact that this is at the heart of the cities historic theater district, which is undergoing a rather dramatic and exciting rebirth, made it seem an even more appropriate place to celebrate the renaissance of the most famous highway in America. The Palace Theater built in 1910 was the focal point for a series of fascinating conferences that ran the gamut from utilization of social media to promote events and businesses, and the power of Yelp, to the excitement of traveling the storied old highway in the modern era. A showing of The Grapes of Wrath was also on the schedule of events that took place in the lovely old theater. I was honored by a request that I speak at this historic event, and in such a stunning setting. The theme of my presentation was Route 66 as the crossroads of the past and future. 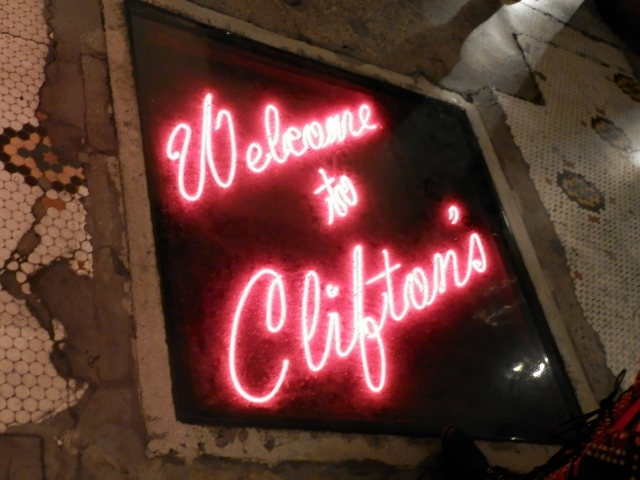 With a website as unusual as the restaurant itself, the recently refurbished Clifton’s Cafeteria, just a few yards from the original western terminus of Route 66, became a focal point for lunch and dinner gatherings. This stunning architectural masterpiece opened in 1935, and the recent restoration was completed with an eye for detail to ensure that its unique interior appointments and murals were as close to original as possible. There are even some fascinating displays of original neon. Though the festival did not develop exactly as originally planned, and it fell short of the initial expectations and envisioned scope, it accomplished the primary goals set forth by organizers; introduce the Route 66 community to the wonders of the Route 66 corridors in the greater Los Angeles metropolitan area and in surrounding communities, encourage enthusiasts to explore beyond the confines of Route 66, show the world that Route 66 in the metro area can be explored without an automobile, and ensure that everyone in attendance had a memorable time. It was another blending of the business of Route 66 with the fun of Route 66 in one memorable and historic event. A large number of attendees stayed at the Saga Motor Inn in Pasadena on Colorado Boulevard, an alignment of Route 66. Dating to 1956, the motel is truly a well maintained, living time capsule. 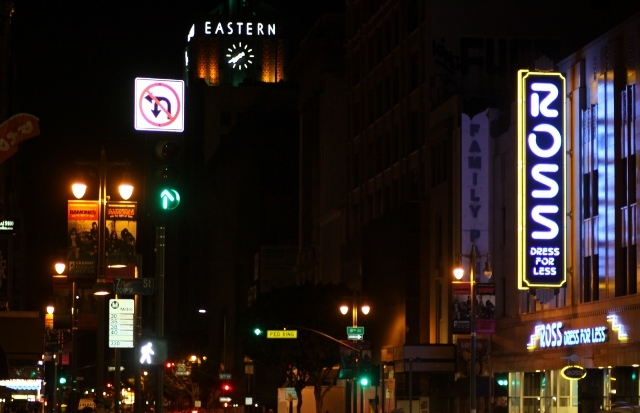 As a bonus, rates are surprisingly reasonable, there are an array of interesting restaurants within walking distance, and the metro rail line that provides an almost direct connection to the historic theater district in Los Angeles is accessed a few blocks away. Proximity to the Saga, and availability of a large private room, was a primary reason that Cameron’s Seafood in Pasadena was selected for the traditional gathering of Route 66 enthusiasts lovingly referred to as “roadies.” The dinner itself was a reflection of the unique nature of the Route 66 community as these events are more family reunion than anything else. In attendance were roadies from several states and five countries including representatives from Route 66 associations in Germany, Canada, and Japan. Another long standing tradition is the Yahoo “Route 66 e-group” breakfast that takes place at a different festival every year. 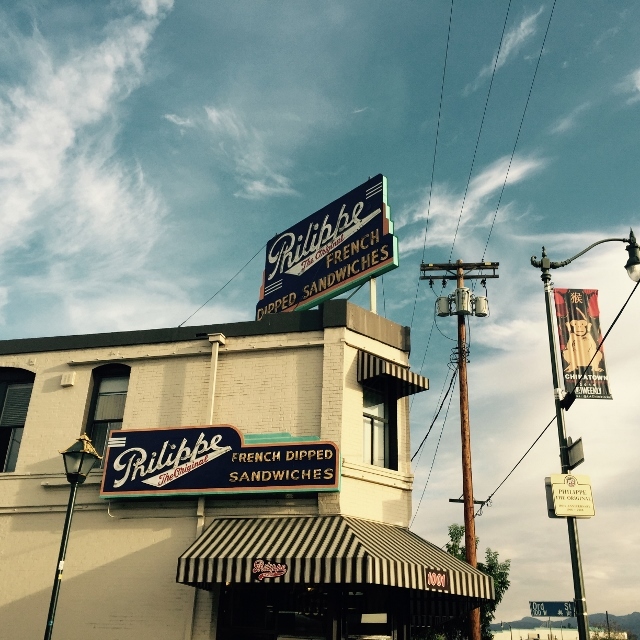 This year the event took place near the historic Union Station at Philippe’s, a restaurant with origins dating to 1918, that has operated from the same location since 1951. The e-group also serves as a place to share Route 66 related news, developments, and messages. There is no cost to join. The restaurant was selected to further give enthusiasts a look at what LA has to offer, and to provide easier access to motor coach tours scheduled for that morning. As always, thanks to the dedication of Mike and Sharon Ward, and event organizers, it was another enjoyable addition to the festival. In addition to providing an opportunity for enthusiasts to gather for breakfast before a day of exploration, it also provides a bit a of fun as well as a promotional opportunity for businesses along Route 66. Throughout the year Mike Ward gathers all manner of Route 66 related promotional materials and souvenirs, including historic maps, that are given away in a raffle during breakfast. Meanwhile, while all of this was taking place, at the opposite end of Route 66 in California, Needles was also hosting an event to celebrate the highways 90th anniversary. As I couldn’t be in two places at once, my evaluation of the events success is based on photos as well as reports. All indications are that it was such a success, there are plans for making it an annual event. The event in Los Angeles, and in Needles, was but one more indication that Route 66, the Main Street of America, is alive and well. It is is vibrant, it is an international community, and it is the ultimate American road trip adventure. To everyone who worked so hard to transform the idea into an event, thank you. To all of the Route 66 family that attended, thank you for making it a most memorable get together.